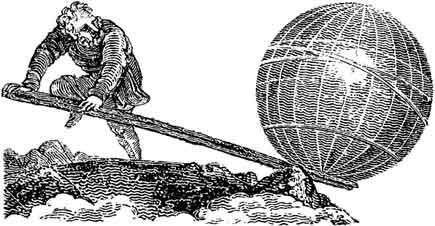 Archimedes said “Give me a place to stand on, and I will move the Earth”. Does Human Knowledge have “a place to stand on”? We have our senses and we have our intelligence. We are handy and have developed all sorts of helping tools. We have mathematics (including logic and statistics), scientific laws, laws of the living and more. We have access to the physical world where we can apply all these tools the best we can. So, do we have a place to stand as demanded by Archimedes? No, we do not. All these tools were granted to us under unclear circumstances. We do not have any control over most of them with the very limited exception of being able to extend somewhat our senses. Our understanding of these tools is patchy and very much confined in space and time. We learn about the Tools of Knowledge through direct Observations. Not having been exposed to the limits of these tools, leads most people to generalize them as universal (from infinity to infinity) through extrapolation. Many think of mathematics and scientific laws as being the “place to stand” that Archimedes requested. They may be, but based solely on Observations, we don’t know. Those that say “these tools are universal” make a Belief (Religion/Philosophy) based claim. Where do the Tools of Knowledge originate? We can either answer “I don’t know”, or provide a Belief-based answer. Looking at other, simpler tools around us, we see that they all are created or adapted to the user’s needs. The more complex these pedestrian tools are, the more remote they are from random, and the more intelligent the user/maker has to be to create and use them properly. ‘Random’ is, of course, itself a mathematical concept and thus unsuitable for informing us on the Tools of Knowledge. A source of these tools would have to be a far more organized, intelligent, and powerful entity than we could comprehend. Con: The laws described by Newton and others are, in fact, descriptions of laws. They are not the laws ‘an sich’ (per se). We only overturned the descriptions of laws, but not Gravity itself. Pro: The “laws” are not descriptions of “laws” but descriptions of ‘observations’. That’s a huge difference. And yes, we call these descriptions of ‘observations’, “laws”. We will never know ‘gravity’ but we will have ‘observations’ consistent with ‘gravity’… and one day a black swan shows up and we call that “black matter”. But maybe there is no “black matter” and in fact “the law of gravity” needs to change. Pro: The concept of Random is not random at all, and usually represents the reluctance to admit the speaker’s lack of knowledge. For instance, in scientific terms, we don’t know the origin of life and what makes a planet livable. All we know so far, is that we have a statistical population of one inhabited planet – Earth. Yet people apply probabilities to “estimate” the number of likely inhabited planets in the known Universe based on some similarities with Earth which may or may not be necessary and sufficient to make those planets livable. Con: We have made good progress in understanding the laws of the Universe that explain everything from the smallest particles to the origin of the Universe. Pro: In our current linear view, the laws governing the Universe are uniform in space and permanent in time. In fact, this is a big assumption that we cannot verify. Step transitions in the Universe like from non-life to life, Big Bang, humans and AI gaining conscience, etc. are assumed with weak explanations (if any offered) that doesn’t recognize their explosive (nonlinear) nature. Con: Indeed, soft sciences are unreliable, but we can rely on the hard sciences. Hard sciences are reproducible, testable, and predictable. Pro: A good definition of Science is: “systemic knowledge of the empirical world”. Sure, at our size/time-scale, the laws of physics seem permanent – reproducible, testable, and predictable. In fact, we cannot be sure the sun will rise tomorrow – our prediction rests on a limited number of past human Observations. All models built around the Observable are dependent on unverifiable Assumptions (Beliefs). If a dice rolls six after six after six, at what point do we decide the dice is rigged? Given this only fact, the correct answer is ‘never’. Hence, there are no ‘hard’ sciences – they’re all ‘soft’. Posted in Views and tagged Archimedes, Human Knowledge, random.